Nice work – unusual subject. Agree- not minis we often see; great work! I though Sweden was neutral? Super and thanks for taking the time to give detailed instructions on what models and paints you used and what alterations you made. Indeed should make for some pretty darn good "what if" scenarios. Did Sweden use US surplus gear? I know nothing about them, of course! Very nice! Good modelling, excellent research. I have read through your blog (in the link) and learned much. I wonder at the conclusion you have reached to work with Italian figures. Not disputing it, just interested in the thinking and the bits and pieces of information that make up such a decision. My un-educated guess would have been that Polish figures would be the most appropriate starting point. As to armor, I'm sure you've been guided by others, but don't forget to put some Landsverk L-60 tanks on your list! What a great chance to put this very Swedish, very innovative tank on the table. Sold by several vendors in several scales as the Hungarian Toldi. Not claiming to be more than a distant observer*, but a quick overview -- Sweden remained neutral throughout WW2. But it took a lot of effort on the part of the Swedes to do that. There were several ways they could have been dragged into the war. They were a critical supplier of raw material to Germany -- especially ore, but also coal and some other materials. Germany was so dependent on Swedish ore that they invaded Norway to "encircle" Sweden and keep it within the German sphere of influence. The potential of Norway becoming an Anglo-French client was strategically intolerable to Germany even in 1940, predominantly because it would threaten their ore supplies from Sweden. It was only later in the war that Norway also became useful as a base from which to interdict Allied convoy routes. As Per shows in his blog, there were German operational plans in place for the invasion of Sweden, in case the ore shipments were ever threatened. These offer fertile grounds for what-if scenarios. The other potential what-if direction would be allied intervention to block German access to Swedish ore. The most likely of these scenarios would be Russian intervention. There might be cases to be made for early/mid-war clashes from Soviet pushes from the Kola region (provided they ever made real progress against the German forces in Norway), or late-war after Finland signed an armistice with the Soviets (if Finland had not done as well in resisting the Soviet invasion, and had wound up with Soviet forces occupying or at least transiting Finland). I could see potential for a 1944/45 campaign where Soviet forces pursued Germans across Finland (nearly happened, as the Soviets were quite testy about how slowly the Finns expelled their former co-combattant Germans from Finland's lands). Imagine the complexity of a campaign where first retreating Germans, and then pursuing Russians, come into conflict with Swedish troops. Surplus would not be quite the right term. They did not receive supplies from almost anyone during the war, as far as I know. I suppose they might have gotten a bit from the Germans in trade, but most of what they had was indigenous (Bofors, SAAB and Landsverk were Swedish arms producers), or had been acquired before the war. Several licenses had been negotiated, so for example their squad light machine gun was based on the US BAR, while their standard rifle was a Mauser of local Swedish caliber (6.5mm). So you have an army in 1944 that is modestly well equipped to 1939/1940 standards. 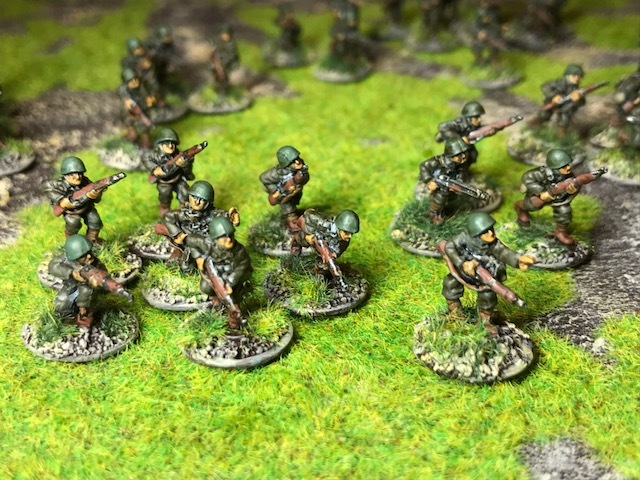 But most potential adversaries would be using light infantry, and if they had heavier forces it was likely to be third-line kit, with perhaps a few more modern pieces scattered about … unless/until the Soviets got involved. All in all, I predict great fun for wargamers!